When we climbed into the cabin of Chevrolet's newly redesigned 2014 Silverado pickup truck we felt like Mary Barra must have felt upon learning she'd just been named CEO of Chevrolet's parent company, General Motors. We were on top of the world. Envision some woman at a job site scanning architectural specifications, with her tablet easily providing every detail as needed, this is a vehicle that took a lot of thinking. And considering Barra's previous iteration heading up GM's design efforts we suspect she had something to do with the thoughtfulness that went into it. How vehicles relate to both men and women is one of the key factors Road & Travel Magazine (RTM) looks at when choosing the best truck of the year. We consider the Silverado a thinking person's pickup, anticipating what's needed and providing just the right solution. That makes driving a pleasure instead of a chore. And it's one of the reasons we choose the Silverado as Road & Travel's "International Truck of the Year" winner for 2014. 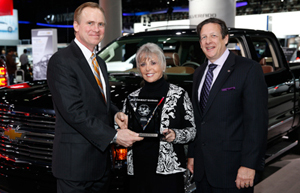 Presenting the 2014 International Truck of the Year for the Chevrolet Silverado are Courtney Caldwell, editor, Road & Travel Magazine; and Mike Martini, president Bridgestone OE Americas, and ICOTY's 18th annual award sponsor. RTM editor Courtney Caldwell noted that Chevy's win comes on the 18th Anniversary of the ICOTY awards as well as RTM's 25th anniversary. She cited overall styling, new and more comfortable interior and improved miles per gallon among high points. Its appeal for women as well as men was highlighted in Chevy's groundbreaking commercial as seen here on You Tube, "Her Horse - A Woman and Her Truck," said Caldwell. "Chevy has achieved a remarkable milestone... marketing the Silverado with both genders in mind, those who are active, athletic, rugged, independent and confident. And, as in the case of the 'Her Horse' commercial, a woman of many faces and many hats, and accomplishing this without a hint of 'chick flick' in one frame."